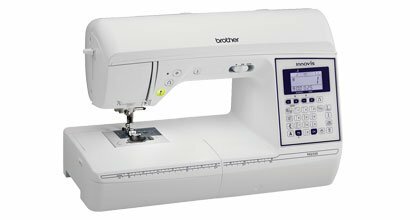 Find your sewing passion with the newest addition to the Q-Series line-up: the NQ550 Trendsetter. The Trendsetter is the perfect trendsetting machine, offering flexibility, convenience and exciting features at a super affordable price. Its professional-grade quality allows you to expand your sewing capabilities to new levels. Feel the difference in sewing with longer feed dogs for better stability and enhanced fabric control. 100 built-in sewing stitches, 7 styles of one-step auto-size buttonholes and 4 sewing lettering fonts. 8.3" from needle to arm: more room to the right of the needle makes it easier to work on projects of all sizes. Reinforcement stitch: automatically sew a tie-off stitch when working on your projects, so useful for decorative stitches. Improved sewing: longer feed dogs and zigzag foot. Personalize your stitches with the stitch combination feature! Customization has never been easier. Manual thread tension allows you to make adjustments that suit different weights of thread. Easily adjust the pressure of your foot to accommodate various types of fabrics.